The basalt stairs cleaned, swept and neat. The wall drawn in gauze. With the gauze what has been washed onto and off the steps I would like to record its distortion. Copy the pattern and translate it into another fibre. Possibly in PVC tube, which would catch the light. Well it's about 2 meters. The same 2 meters that went to Tasmania. 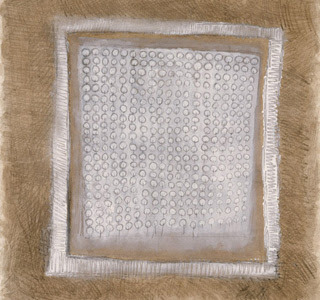 This follows Adair's comment about the lines of gauze being like drawing and is an experiment for a larger work. The coconut fibre with netting, in huge rolls, looks as if it will break down just as the gauze has. Also it looks like it will act like the jute that was used in Tasmania to protect the fragile high country ground cover. The horizontal spun gauze has begun to pull away from the edges. The warp and weft have crept together in some areas and pulled apart in others. In this podcast William Kentridge talks about film and his work. I liked his discussion of walking and thinking. Promenade, after lunch. His extension of the promenade, to the ongoing walk between camera and drawing being an essential and important part of the development of his works. I think about my wrapping of the trees and the people and the images of physically unrolling the role of gauze. I recall the concentration on the unrolling, the swiftness, the placement, the tautness, new ideas, new pathways, moving, many ways of moving, the slowing and the weaving on a human scale. Also cutting of the gauze. It dividing in front of you, wide to narrow. Also the time spent cutting the gauze is a time to develop ideas.Kentridge also talks about painting with honey to attract ants to animate, love that. Sussman’s referred to Hesse being viewed as the as the first post modernist, as she 'took herself as ego in control out of it- let the other thing become the author’. Sussman identified the post modernist characteristic as – ‘the thing itself or task at hand or the material that’s going to generate everything, everything- every transformation comes from and suggests something to her’. The material in one example is 'thread' that she found when she worked in Germany in an old factory. The thread made its way into her work. Some of Hesse’s sculptures had not been exhibited before her death and had not been see outside the studio therefore there was an uncertainity about the orientation of the work. Sussman says that Hesse would have been OK with the installation of the work as Hesse had said that ‘she thinks things ought to change according to who installs and where it is installed, each installation being a transformation’. I feel that the willingness of Hesse to allow the ‘curator’ install her work, and in that, change the way it is viewed is another example of taking herself as ego out of the work. Sussman says the ‘Taking herself out of the work, especially at the end of her life when she was very ill, this could parallel with ‘taking herself out’.... of her sickness. Maybe a Buddhist type thing...’. I can see parallels in my work for example the gauze installations. The gauze is fragile in comparison to more traditional sculptural materials such as wood, bronze and stone. The gauze installations are controlled by the wind, rain and sun which changes them from their original white tightly stretched form. I also sometimes work in collaboration with other people . In ‘Working at Peartree’ I gave control to the individuals I was working with. Those people who had cut the gauze. The cutting of the gauze is different with every group and with every place. The ‘Peartree’ cutting was with the largest group of people to date, the gauze formed lines in the landscape, turned around trees, stretched against the breeze. The people working with me, the collaborators, defined the work. While we were cutting I tossed the idea around in my head that I should give the 4 rolls of gauze to those participating to install a work. This was giving control to others. What would they do, it wouldn’t be my work, how would it look!!! I set guidelines: a comment on the place. The works become more about that process of sharing both the physical work and the ideas rather than the finished works. Sussman also discusses Hesse working with the children of a friend while in Germany. Drawing the alphabet leading to using little boxes and thinking in a grid. These experiments were recorded in note books. I think that Hesse has become involved with a complex unpacking of the process of learning and communicating. Hesse is experiencing the process. A letter of the alphabet, a symbol simple, essential and emblematic. An embodiment of language and communication. I see Hesse as possibly going back to things learnt as a child, that are the forgotten building blocks. I have found wonder and surprise, in working with children as to how letters go together to make language and communicate. Hesse’s development into gridded works seems is as if all the extraneous meaning has been removed and the underlying essence remains. Getting into the physical making of a letter, she found ‘drawing to learn’. 'drawing to learn' is a link to Margaret Brook's web site where she documents a Visual Ethnographic study that examines young children's use of drawing in a grade one classroom. I moved through the words, imagining the description, being part of the words, being part of the vista, looking at the landscape, the words, the vista, flowing in and out. I began to remember the movement and thus the words. My body remembered the movement and began to pre-empted the words, began to repeat without thinking. The body has memory as well as the brain. A rock on the coast with a membrane which has dried and become tightly stretched reminding me of the way the gauze acted on the steps as it was wet and dried. Margaret and Mike with 2 meters of gauze, rolled at each end. The boardwalk at Cradle Mountain has chicken wire laid over it to help make the surface less slippery. The boardwalk made of timber, built to walk on above the wet and fragile land. This reduces the impact of the huge number of visitors that walk around the lake. New year 2008 it was unusually dry. Tasmania had not the rain that we enjoyed in New South Wales. Mount Tomah Botanic Garden as its basalt pavers and Italy too. Here they would (in a normal rain year) sink into the mud. This resting place is located at the front of the council building at Triabunna. A dry stone wall. I can imaging sheltering from a blasting wind in its curve. Top of the cliffs at White Wall, allocasuarinas make a soft spot to rest and they draw with their shadow 2 meters of gauze at White Wall with Mike at the other end and Haydn taking the shot Working, firmly attached to the gound. On Maria Island, Tasmania we found an inlet which was trimmed with white 'gauze'.